ATR’s continued celebration of becoming the Guinness World Record holder for the most collected electronic pounds in one week during Earth Week last month, was an extraordinary accomplishment. Our Pontiac site had numerous employees who stepped up and extended their time and effort to accomplish this record. However, there was one individual who was detrimental in making this effort succeed. Joe Bickett is ATR’s Pontiac site’s employee of the month for May. 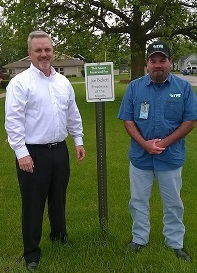 Joe, pictured on right with Ray Magee, started with ATR in May of 2011 and is ATR’s Logistics Supervisor. Great job Joe! Thank you for everything you do.